I adapted this recipe from one that I found on Allrecipes.com – one of my favorite websites because I love to read people’s reviews of different recipes! It’s been a much-loved treat in my family and my husband’s family ever since I discovered it. 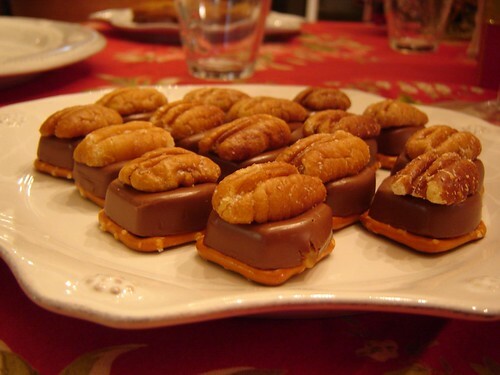 These candies are SUPER easy to make and taste amazing with the combination of salty, sweet, and chocolate all melding together in one scrumptious bite. 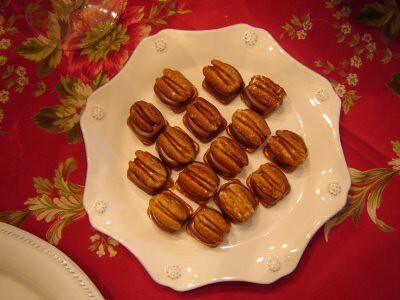 You can use regular raw halved pecans, roasted pecans, or roasted and salted pecans in this candy. I usually roast and salt some raw pecan halves that I get from a local place here in Georgia. Preheat oven to 300 degrees. Combine all ingredients in a medium bowl and toss until pecans are evenly coated with butter and salt. Arrange mixture evenly on large baking sheet and put in the oven. Cook for 20 minutes, or until nuts are fragrant and just starting to brown, stirring about every 4-5 minutes. Cool the nuts and enjoy or add to your favorite recipe. Preheat oven to 250 degrees. On a large cookie sheet, line up pretzels and top each with one caramel-filled chocolate. Put in the oven for about 5 minutes, or until chocolate is shiny and beginning to melt on the outside. Remove from the oven. 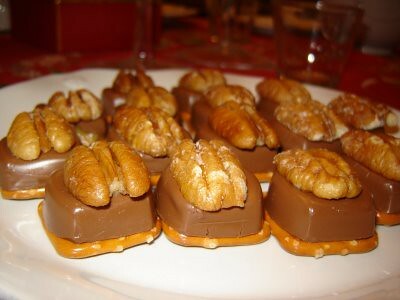 Top each pretzel/chocolate with one halved pecan, pushing down lightly so that pecan adheres to chocolate, and chocolate adheres to pretzel. Allow candies to cool completely, and enjoy! Makes about 60 candies.